Ever since I started blogging I have waited for Mixology Monday to arrive. February is Tiki Month and it is only fitting that this Mixology Monday be Tiki themed. This time it is hosted by the Pegu Blog. Pour all ingredients except for the soda into a cocktail shaker and dry shake for approximately 20 seconds. Add ice to the cocktail shaker and shake for close to 1 minute. Pour the orange cream soda in the bottom of a glass then strain the contents of the shaker into the glass. Express a orange twist over the top of the drink and discard. The rum comes through and makes itself known without overpowering the drink. The bitters, curacao, and soda dance along your taste buds providing them with an array of orange notes that awaken the senses. This combines wonderfully with orange aroma from the essential oils that are sitting on the egg white cloud. The dryness of the curacao and bitters help to cut down on the sweetness. The drink has a silky smooth texture with all the flavors playing in harmony. My second drink was originally created for a friend of mine who really loves coffee. So I gave her the honor of naming of it and out came the Starbuck (named after the character from Battlestar Galactica, not the famed coffee spot). Shake all ingredients with ice then strain into a glass filled with crushed ice. Garnish with a lime shell filled with coconut. Torch the coconut with a light flame to toast. 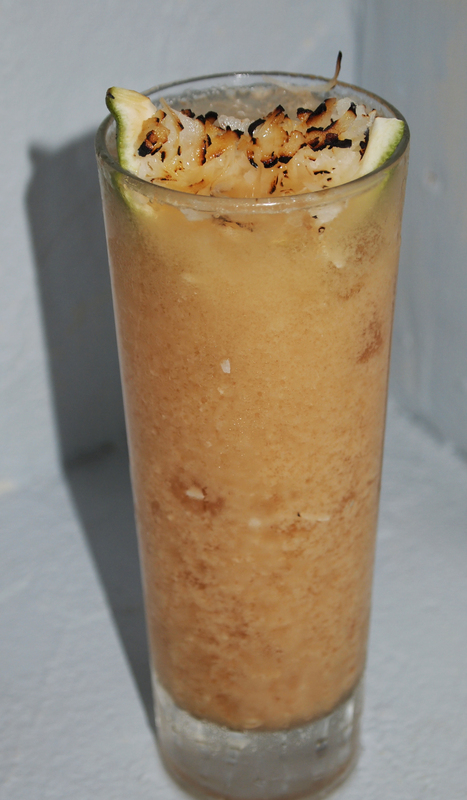 The frutiness of the coconut cream and banana liquer combine well with flavor provile of the Blackwell Rum that I used. The coffee keeps it from being too sweet and adds a hint of chocolate in the background. The Angostura and the Allspice dram add a hint of spiceness throughout. The Orange Soda/International Delight thing is as repulsive to me now, as an adult, as it would have been attractive as it would have been attractive to me then as a kid! I like your grown up spin on your childhood drink and I’ve filed it and the Starbuck to try a bit later.